long_descriptionEvery critic, blogger and Londoner has sung the praises of Franco Manca, whose pizzas are 'the best in Britain' (Observer). The owner, Giuseppe Mascoli, knows that the best pizza in Italy comes from Naples and therefore, as an expat Neopolitan himself, he has gone back to its roots, where making pizza is all about simple things (bread, tomato, cheese) and simple steps (make the dough, let it rise, flatten it, add topping, bake in the oven), all using the best ingredients to produce pizza of exceptional quality. Aimed at the home cook who doesn't have a traditional woodburning oven, Giuseppe has tailored his recipes so you can use a pizza stone or a heavy baking tray and still get great results. His famous, slow-rising sourdough recipe produces a soft and easily digestible crust, there are 50-60 recipes with seasonal variations, plus chapters on fritti (fried starters) and salads and also tips and techniques for making your own flavoured oils, preserving your tomatoes and curing your meat. 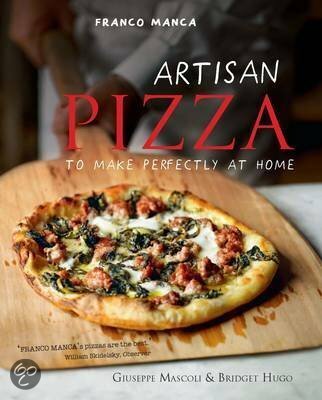 Without a doubt, this is the closest you'll come to the real deal in your home kitchen, and in your personal quest for perfect pizza.